Let us share with you some of our activities: Taylor Graham's poetry, Hatch's bird banding, our search dog activities, and pictures of family and friends. 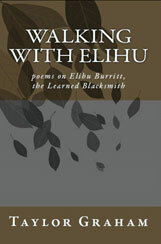 Taylor's new book, Walking with Elihu: poems on Elihu Burritt, the Learned Blacksmith, is now available on Amazon. Walking with Elihu is a selection of Taylor's poems on Elihu Burritt, the Learned Blacksmith, international peace activist, advocate of the common man, and observer of the Industrial Revolution. The book includes a short biography and 94 poems dealing with Elihu's life: his study of 50 languages while working at the forge; his struggles to promote peace in a time of Civil War; his End-to-End walks across Britain; his tenure as Consular Agent at Birmingham, England under President Lincoln. A practical working man who was also a dreamer, Elihu exulted in skylark song and, in an age when woman's place was not in higher education, instructed schoolgirls in Sanskrit. The poems range from free verse to formal (sonnet, villanelle, terzanelle, sonnetelle, and others). Website design and content copyright © 2010 Hatch Graham and Judith Taylor Graham. All Rights Reserved. Design and additional graphics by Dancing Eyes Design.